Your perfect dress is waiting for you. Only at Love it at Stella’s will you have a large inventory of bridal gowns to select from, on-site alterations, and a boutique environment with a tradition of warm personal service. Our bridal consultants will assist and cater to your every need to help you find the wedding gown of your dreams. From gown selection to final fitting, their expertise, professionalism, and attention to detail will give you and your bridal party a “one stop” convenient experience. 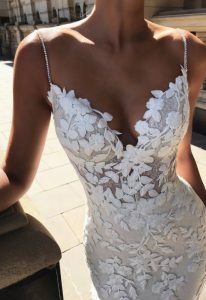 For over 50 years we have been providing bridal gowns for Baltimore city, Baltimore County, Carrol County, Howard County, Montgomery County, Frederick County, and Pennsylvania. Come visit us, and you will be amazed at what you see. Love it at Stellas is dedicated to serving the brides of Carroll and Baltimore county, and the surrounding area. Among our vast collection of bridal gowns, we also make a special effort to provide for curvy and plus-sized brides. Our store is a haven in the spring for those looking for prom and formal dresses, and a one-stop-shop year-round for the bridal party, including the groom’s tuxedo, the mother of the bride’s gown, and bridesmaids dresses. We have a long history of serving brides in the Baltimore region. The store originated as Pacey’s in the early 1960’s. In 1988, the shop was featured in the original Hairspray movie produced by John Waters, a Baltimore native. We are now located in a beautiful historic building just off of Westminster’s Main Street. Copyright 2017 Love it at Stellas. Designed Kohn Creative.